Today was just about the most perfect ending to the the GDT I could imagine. Plenty of photos to share today! We got going at 6:30am to a clear brisk morning. It was quite cold and a little windy, but CLEAR SKIES! That meant that we could do Surprise Pass High Route. 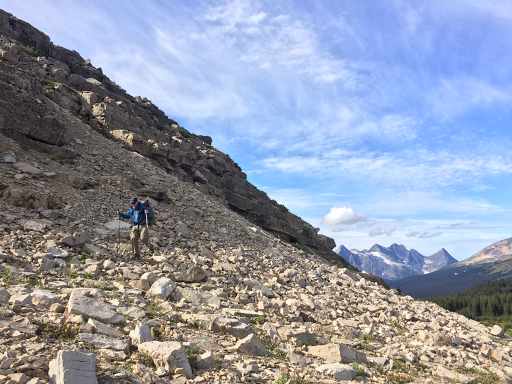 The first of two high route alternates we hoped to do today instead of low level bushwhacking in mud. 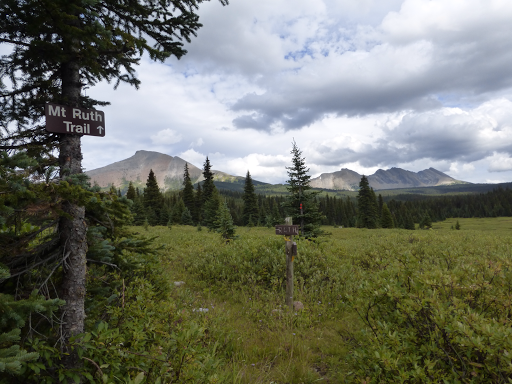 The route is described briefly in the guidebook, but is untested by previous hikers that have contributed to Ben Mayberry’s resource packet. There was a general GPS track that we got off the GDTA page, but it was hard to know if it was drawn in from someone on a computer or a track that had been hiked before. Either way, we were game to give it a try and knew we had the time and good weather to turn around if need be. The alternate is listed as .6mi longer in the guidebook, but the track has it at 2mi longer. We also knew it would be slower going than the low route with climbs and rocky terrain, but we were psyched like kids on Christmas to be able to do it. 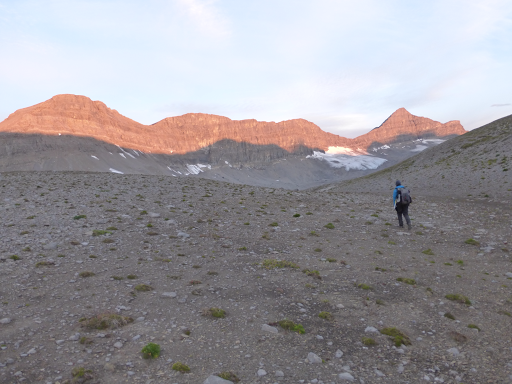 So with just about all our clothing on, we headed out over Surprise Pass as the sun came up behind us. Once up there, we saw that we totally could have camped on the other side of the pass last night with many groups of trees as options. We could see our cross country route too. 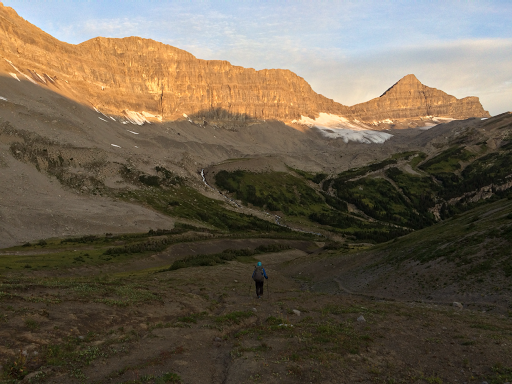 We would go down to the valley, and rather than staying low and turning the corner, we would hike up just right of the waterfall to then hike below the Wallbridge Glacier on the right side. It was a fun route and we were really glad we did it. The hiking wasn’t as slow as we anticipated and we were done by lunch going at a very relaxed pace. There was a lot of stopping for photos. 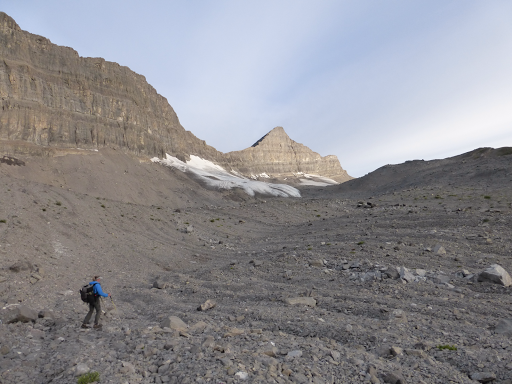 As soon as we got up there, we realized that the route we chose to take had us hiking on Wallbridge Glacier and that was fun. 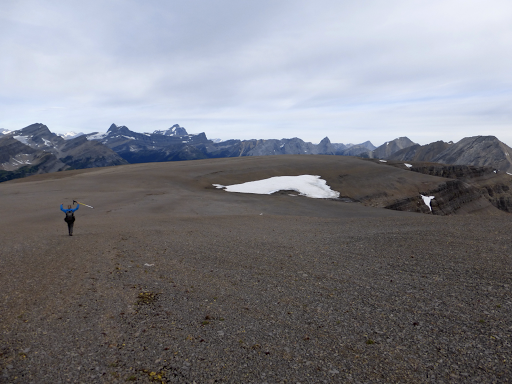 Once past the glacier, we needed to go to the top of the flat table topped mountain of Wapati Mtn. 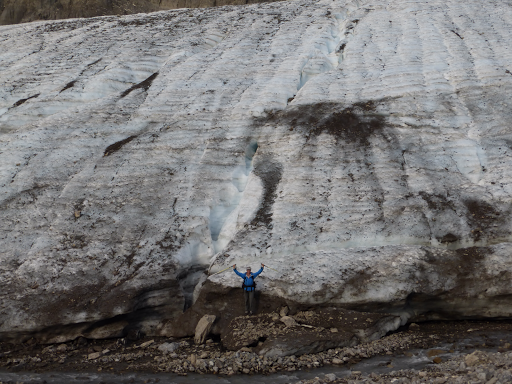 We passed some small glacial lakes along the way. 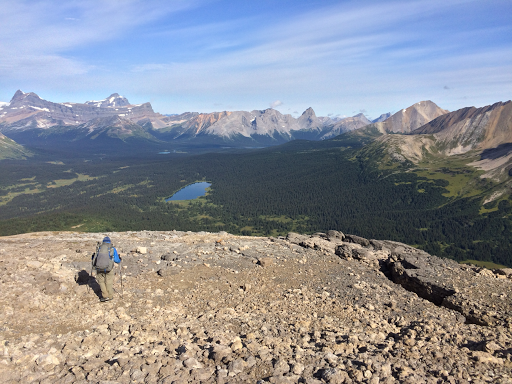 It wasn’t a bad climb and we got up fairly quickly to see some great views, including looking down on the low route near Cecilia Lake. Pretty cool to see what we would be doing had we stayed low. From there, we walked the extended table top of Wapati and took in the views as we walked down the backside on one of the noses. We loved it and it felt really freeing with all that space. 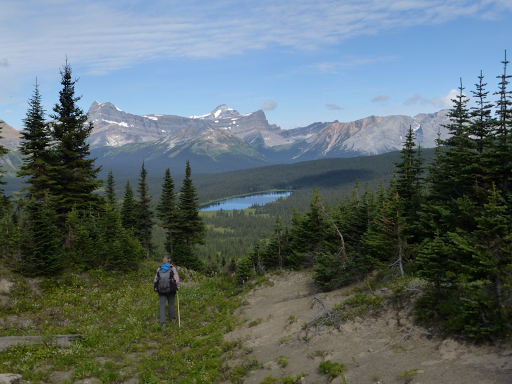 As we headed down, E realized we could see our second high alternate route coming up, and even more exciting, Kakwa Lake! 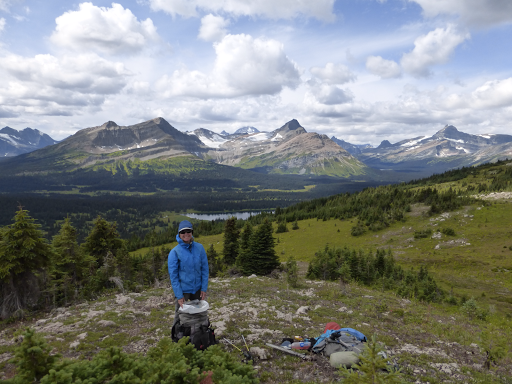 We spent a ton of time taking photos with Kakwa in the distance. Our next alternate will be to walk just above tree line traversing the three mountains on the right. The low route reportedly has no trail and has deep sucking mud most years going along the south tip of Broadview Lake at the bottom of the photo. Kakwa Lake is more in the distance. From this viewpoint, we needed to do a steep climb down the back of Wapati Mtn. You can choose your own route down and we don’t know if ours was most efficient, but it worked. 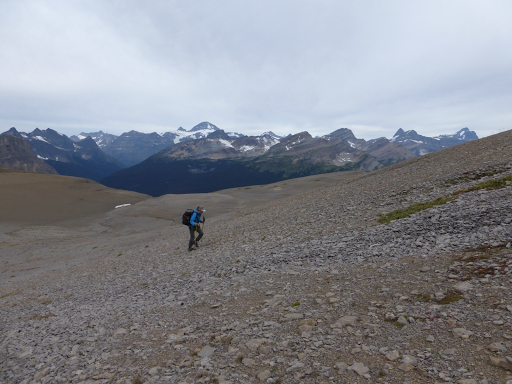 It started off with steep scree sort of terrain, then bands of drop offs to zig zag thru, then a steep grassy area to work through. This down climb is the one part I’d caution people of if they are not a fan of exposure or unstable footing. 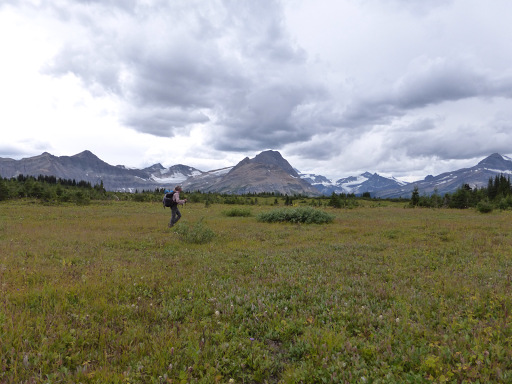 Especially wet, I could see it being more sketchy, but we did just fine and made it down to Providence Pass. Totally recommend Surprise Pass if the weather allows! After tagging Providence Pass (crossing the official GDT route) down between the two alternates, We bushwhacked through tall grass and forest to start the Providence Pass alternate. This one is listed as 2mi longer than the low route, but the GPS track has it as 3.5mi longer. We could see from our previous view that it wouldn’t be smooth ridge walking like the first alt. This one took more effort and we were up high for a shorter portion of it. Again, not recommended on a wet year as it was side hill hiking along a semi-steep grade in tall grass. It wasn’t for long and we had fun with it weaving around trying to find the most efficient way. I haven’t done the low route, but I still think it’s got to be better than the alternative bushwhack below. Plus, having the views to finish this hike is what it’s all about. 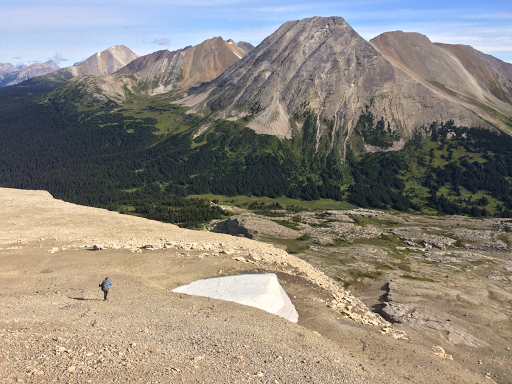 We had lunch up top and looked back on our day and ahead toward Kakwa now hidden around a corner. We even had fun bushwhacking down…for the first half hour or so…then the willows and downed trees got more prominent and we tried to find the trail. We had the GPS track from the GDTA, but again didn’t know if it was a generally drawn track or one that had been hiked on the ground. Either way, we tried to use it to find the possible trail with no luck. Brush it was all the way down for another hour or more. My claustrophobic side started to creep in as some rain started to fall and I stopped to put on all my rain gear and batten down the hatches expecting the whole wet brush car wash effect. Of course, E patiently let me have my freak out moment as she stayed out of rain gear and the rain passed. I got to sweat out the rest of the climb down in rain pants and we got to laugh at my PTSD freak out. When we reached the bottom, of course, there were clear blazes and an even cleared trail junction to the Mt Ruth Trail we had been looking for. 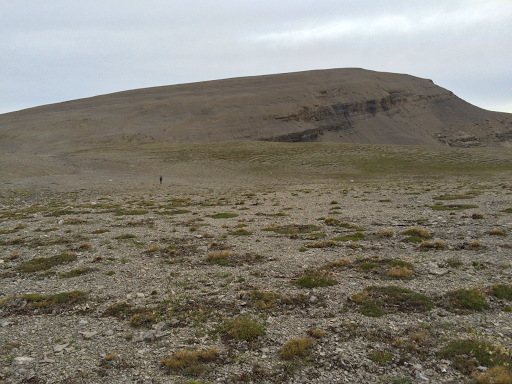 It was much further north of where we had been searching and we weren’t even close. The GPS track was not near it. A totally fitting way to end this hike with one final unnecessary bushwhack, ha! 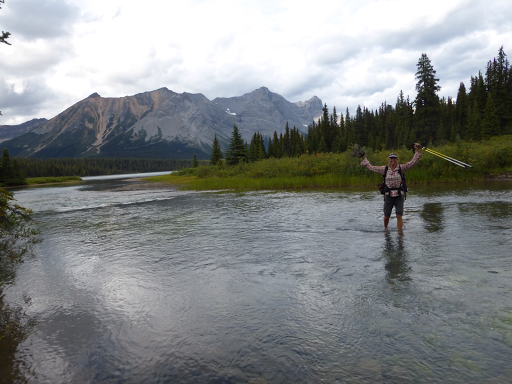 We did our final ford over the inlet to Kakwa Lake and wore our sandals because we actually had dry shoes! 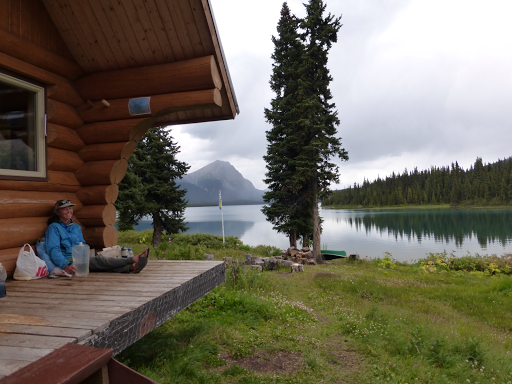 There was a small semi-wooded camp spot that we passed to check out the cabin we heard was there and the warden cabin that we heard was infrequently staffed by volunteers through BC Parks. There were people there! Cy and Irene were there for 5wks as volunteers to supervise the area. 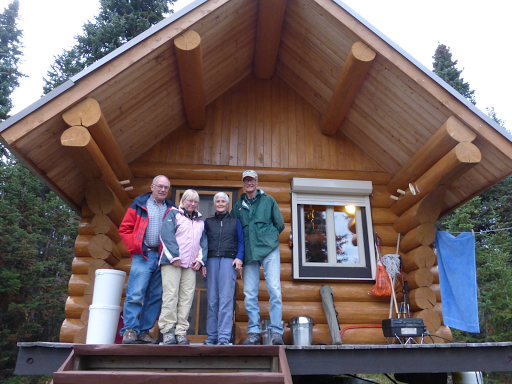 Their friends, Marilyn and Jim had flown in on their float plane to visit for a week and were staying in the public cabin. The cabin is actually free, overlooks the lake, and they said we could stay in there with them! It’s open all year round and free to whoever shows up. Just amazing! Here’s Jim, Marilyn, Irene, and Cy. Even more amazing is that the temps dropped quickly as we made dinner and the rain began to fall. 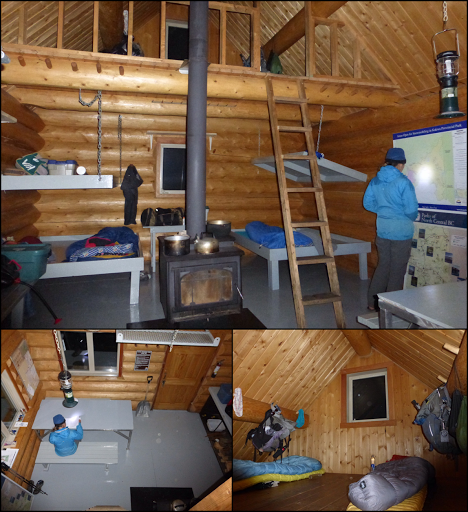 What luck that we made it down and into a warmed cabin on a blustery cold rainy night! We sat on the covered porch and took in the view and moment as the rain fell. 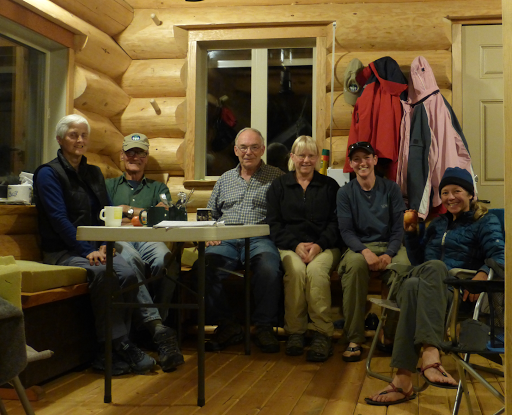 We spent the rest of the evening staying up late visiting with Cy, Irene, Marilyn, and Jim in the wardens cabin. Cy and Irene have done this many summers over the years at various parks and were first here in 1996 when they helped blaze the apparently great Mt Ruth trail we completely missed today. They are celebrating their 50th wedding anniversary this year, so cool! 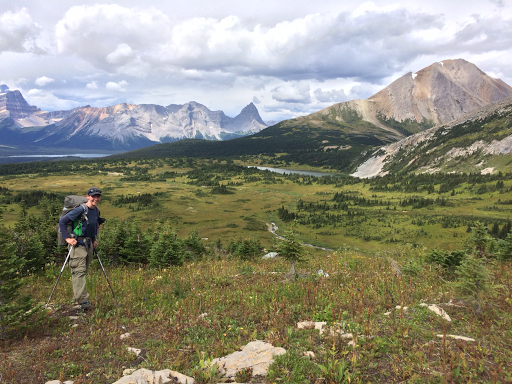 They say of all the places they’ve volunteered at for extended periods, Kakwa Lake is their second favorite…their favorite one…Assiniboine where we were on Day 18! In the photo, E is holding one of the nectarines Irene gave us that we are saving for tomorrow. I said this was almost a perfect ending as I think the perfect way to end would be to take off from the lake on a float plane and fly over everything we just did. That would really be a dream! When the rain paused for a bit, we went outside and took finish photos on the dock. 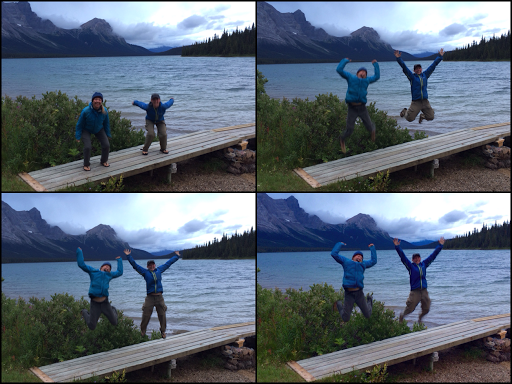 Of course, we had to do some celebratory jumping ones too! We’ve been sticking to Alberta time, which is an hour earlier than the BC time they are on. We visited til 11pm for us and I wasn’t asleep until midnight. All worth it! 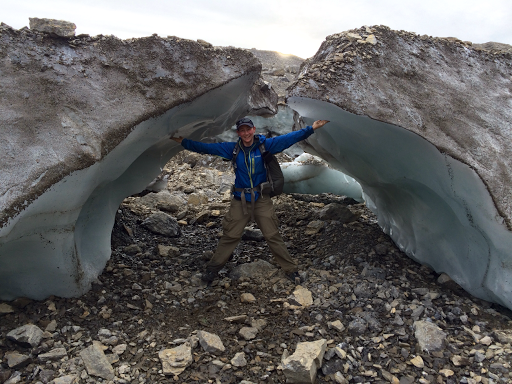 Part of the challenge of ending at this remote Kakwa Lake, is finding a way out. We have 18mi of dirt (er, mud) road walking tomorrow to get to our pickup spot that I’ll explain in the next post. Right now the rain is coming down and the wind is blowing hard as we hear a pestering porcupine we’d been warned about going to town gnawing on the porch of the cabin. These cabins were built to replace older ones in 2008 and are in amazingly good condition. It’s so warm and cozy in here! I forgot to take pictures before it got dark. Totally sleeping in tomorrow. What a great finish!